You know how some of those old Disney songs have all these weird words to remember? If you can recite entire verses of Higitus Figitus without a cheat sheet and a degree in linguistics, you are either some kind of savant or your name is Richard M. Sherman. If you can’t, don’t feel bad. Even Disney World has problems sometimes. If the President can’t get through a speech without a teleprompter, then we’ll forgive you and Disney World for a few bloopers. For instance, Innoventions is especially mistake prone. Most people consider this one giant mistake anyway. 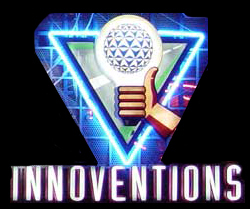 There used to be a pretty egregious factual error on the Inventors Circle just outside the Innoventions breezeway (this is perhaps a topic for a future time, since I’m not sure if the error is still there). And we kicked off parkeology with this little mistake from the Epcot timeline inside the building. But even at the Magic Kingdom, the imagineers are not immune to getting it wrong. 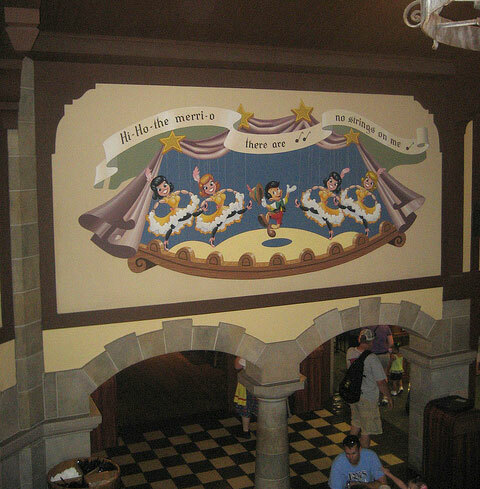 Just a nice little unassuming mural on the wall of the Pinocchio Village Haus. We recognize it immediately as a scene from the movie, and even if we’re a casual fan, we probably can hum the song that it’s showing us. We’d sing it, but it has those darn Disney nonsense words at the front. 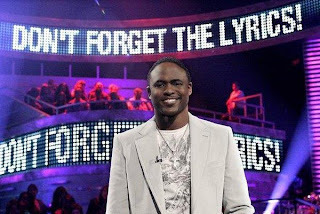 “I’ve got no strings on me” is merely the song’s title, as well as a line from the chorus. Incidentally, the sheet music for Pinocchio spells it “Me-ri-o.” The song from Snow White spells it “Heigh Ho.” Movies have hundreds of continuity specialists to make sure this doesn’t happen. 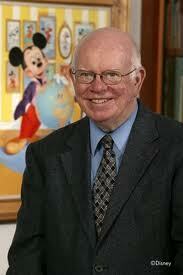 Disney apparently just relied on Dave Smith. An $18 billion company, and this was the only guy doing any fact-checking. It’s a miracle that the Great Movie Ride doesn’t have Bogey saying “Play it again, Sam” (never said it) or James Cagney calling somebody a “dirty rat” (Cagney says “dirty double-crossin rat” in the movie, though the Great Movie Ride cuts “rat” for some reason, I guess out of deference to Mickey). They do say “That’s one small step for man” in American Adventure, but that was Neil Armstrong’s fault, if anything. Maybe it’s just an isolated incident. They just need to get the Pinocchio Village Haus on that Wayne Brady show. “Excuse me while I kiss this guy” — Jimi Hendrix. This entry was posted in Disney Theme Park Hidden Secrets and tagged Epcot, Fantasyland, Innoventions, Magic Kingdom, Pinocchio Village Haus. Bookmark the permalink. I do apologize for my unwarranted tantrum, which was clearly over the top and totally uncalled for. But make no mistake about it, this Pinocchio Village Haus mural is the defining issue of our generation. I always assumed this was a summation of the song, as Emily said. But don’t worry, Shane, your savoire-faire is still ooh-la-la. Yea Shane… Calm down, stop throwing fits already! I’ve seen that mural a thousand times and never assumed that they were trying to quote a direct line from the song… It’s just two lines that sum up the song best. I think you’re throwing a fit for nothing, lol. I love finding other people who notice the little things! Now I will have to look for that mural.